Yes, bath salts. Authorities say people across the country have been snorting, smoking and injecting these powders. The chemicals in the salts — which can be legally purchased — cause dangerous effects that resemble those of methamphetamines. And a high that users can’t seem to resist. The substances aren't yet regulated by the U.S. Drug Enforcement Administration, but they are under federal scrutiny, and states have begun to take action. Louisiana has outlawed them, and a Kentucky lawmaker says he's planning a ban in his state. Just this year, President Obama signed into law a bill that reduces disparities in penalties for crack and powder-cocaine offenses, narrowing the racial gap in drug sentencing. What will we be watching for next: lopsided punishments for dealers of bath salts versus shower gel? 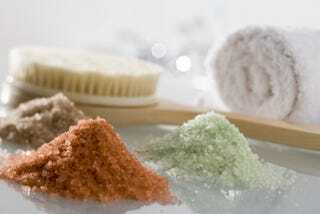 Moisturizing sugar body polish versus exfoliating salt scrub? Seriously, the burgeoning epidemic — while definitely bizarre — is no joke. And given the above-mentioned historical disparities, we at The Root are especially interested in the demographics of this new drug trend, and their relation to the way those who use and sell the salts will be treated. We’ll be watching. Until then, we'll stick to bar soap. In other news: David Simon: No Apologies for The Wire.